A class of students at RIT published Splattershmup, a video game that combines Asteroids-style play and abstract art. The game is being showcased at the 2016 Indie Arcade at the Smithsonian American Art Museum in Washington, D.C., Jan. 16. 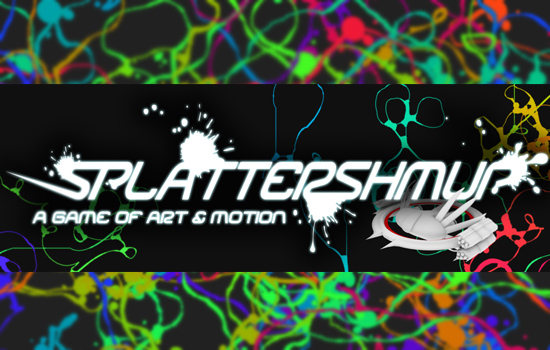 Splattershmup: A Game of Art & Motion has received yet another national accolade, this time selected for inclusion at the upcoming 2016 Indie Arcade at the Smithsonian American Art Museum in Washington, D.C. The desktop computer game, created in 2014 by Rochester Institute of Technology’s MAGIC Spell Studios, is one of 40 games chosen from among 150 international submissions for the Jan. 16 event, which features arcade-style video games, game-building workshops and new indie games. Representatives from RIT’s Center for Media, Arts, Games, Interaction and Creativity (MAGIC) will be on hand to demonstrate the game for visitors. Last year, more than 4,000 visitors attended the showcase. Splattershmup is a cross between a shmup—a classic shoot ’em up arcade game, such as Asteroids—and abstract Jackson Pollock-style action painting. The original concept was created by Phelps and developed alongside Aaron Cloutier, co-lead designer and developer for MAGIC Spell Studios. It was produced by 15 students in a studio course offered through RIT’s School of Interactive Games and Media, with guidance and support from RIT’s Center for MAGIC. The free game is published and maintained through MAGIC Spell Studios, LLC. “This was one of our first efforts for MAGIC around extending student work into commercially published games and interactive titles,” said Phelps. “At the conclusion of the course, MAGIC Spell Studios was able to leverage the prototype developed in an academic setting to a commercially viable product. Currently, that work has produced the version that is available today both online and in the Windows store. In June, Splattershmup was selected to participate at the Games+Learning+Society 2015 Conference Learning Arcade in Madison, Wis., where it was a finalist for Best in Show. The game was also selected for inclusion in the Blank Arcade at the Digital Games Research Association meeting in Germany, and was showcased on the expo floor at Game Developers Conference 2015, the world’s largest professional gaming industry event held annually in San Francisco. RIT’s Center for MAGIC, established in 2013, is a nonprofit university-wide research and development laboratory and a for-profit production studio that assists in efforts to bring digital media creations up to marketplace standards and commercialization. Faculty, staff and student researchers, artists and practitioners come together to create, contextualize and apply new knowledge in a multitude of related fields and disciplines as appropriate not only to STEM or the arts and humanities, but their intersection. MAGIC Spell Studios handles the publishing and distribution of its projects. Splattershmup is available free of charge at http://splattershmup.rit.edu/ for Windows and Mac, can be played online through Google Chrome, and is available in the Windows Store for Windows 8.1 and Windows 10. Following the game showcase, Phelps will be co-hosting an event for Washington-area RIT alumni. For more information about the alumni gathering, go to http://alumni.rit.edu/IndieArcade.